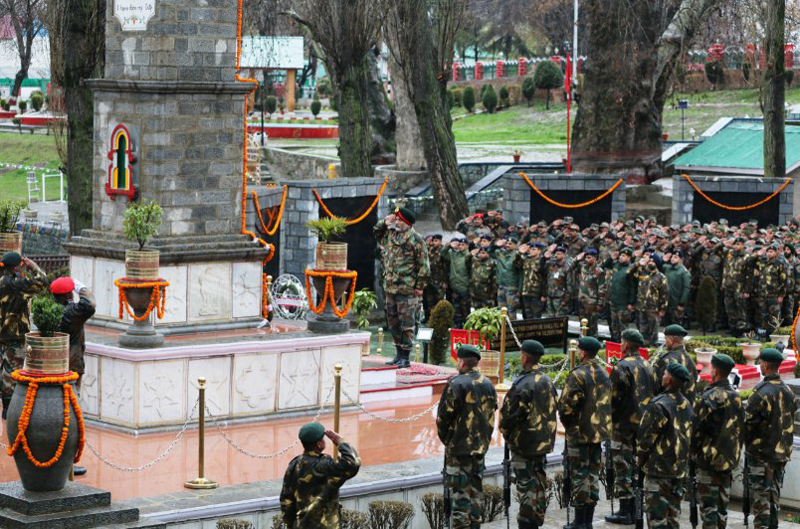 Chinar Corps Commander Lt Gen KJS Dhillon & soldiers paying homage to the martyrs on raising day in Srinagar on Wednesday. SRINAGAR, Mar 20: The Indian Army’s Chinar Corps observed its 78th raising day today, three years after it celebrated the centenary year. The Corps is responsible for guarding the Line of Control in Kashmir. A function was held at the Chinar Corps headquarters here to mark the raising day. Corps Commander Lt Gen K J S Dhillon paid tributes at the war memorial by laying a wreath, defence spokesman Colonel Rajesh Kalia said. He said the Corps was raised during World War II at Barrackpore on March 20, 1942. As part of 14th Army, it participated in the Burma Campaign at Arakan during the World War II. Subsequently, the Corps was shifted to Karachi. In October 1947, the Corps got tethered to Kashmir for the first time when its 161 Infantry Brigade was tasked to fight the invading Pakistani regulars and tribal raiders, Kalia said. “All operations during 1947-48 Indo-Pak conflict were controlled by HQ Jammu and Kashmir Force. Later, on January 4, 1955, at Udhampur, the Corps was entrusted with the role of complete security of J&K state. It made commutable contributions during 1965 and 1971 Indo-Pak wars as well,” he said. However, the Chinar Corps had celebrated its centenary raising day January 12, 2016. A series of events, including an air show, combat freefall by paratroopers and a display by the force’s special dog unit, was held as part of the celebrations. Among those who witnessed the mega event were a number of former Chinar Corps Commanders, including Lt Gen (retd) Nirbhay Sharma, the then Governor of Mizoram. Over the years, the Army has maintained that the Chinar Corps was raised at Port Said in Egypt on January 12, 1916. Defence and army officials did not respond to queries about the change in the raising day. The Army statement issued earlier in the day maintained that Chinar Corps moved its headquarters to its present location in Srinagar in November 1972 following the setting up of the Northern Command headquarters at Udhampur. “Ever since, the Corps has been committed to the mission of ensuring the security of Kashmir region from external aggression and internal security challenges. “Since 1989, when Pakistan launched its proxy war against India, Chinar Corps has been successfully maintaining the territorial integrity of the nation. Towards that end, the counter infiltration operations along LOC and counter terrorists operations in the hinterland have been the mainstay,” the Army said. In the last 77 years of its existence, the Corps has become one of the most decorated corps of the Army, having been conferred with four Victoria Crosses, four Military Crosses, 13 Param Vir Chakra, 20 Ashok Chakra and numerous other gallantry awards and citations. These honours highlight the selfless sacrifices of its valiant warriors, Kalia said.